OAuth 1.0 emerged from the large social providers like Facebook, Yahoo!, AOL, and Google. Each had developed its own alternative to the password anti-pattern. OAuth 1.0 reflected their agreement on a single community standard. In 2009, an attack on OAuth 1.0 was identified which relied on an attacker initiating the OAuth authorization sequence, and then convincing a victim to finish the sequence – a result of which would be the attacker’s account at an (honest) client being assigned permissions to the victim’s resources at an (honest) RS. OAuth 1.0a was the revised specification version that mitigated the attack. In 2009, recognizing the value of more formalized standardization, that community contributed OAuth 1.0 to the IETF. It was within the IETF Working Group that the original OAuth 1.0 was reworked and clarified to become the Informative RFC 5849. In 2010, Microsoft, Yahoo!, and Google created the Web Resource Authentication Protocol (WRAP), which was soon submitted into the IETF WG as input for OAuth 2.0. WRAP proposed significant reworking of the OAuth 1.0a model. 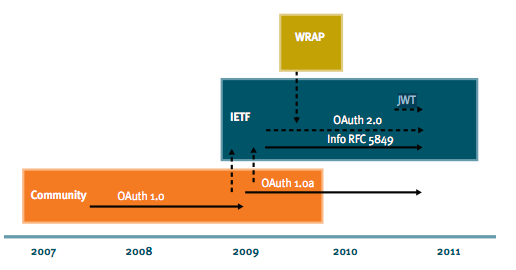 Development of OAuth 2.0 in the IETF consequently reflects the input of both OAuth 1.0, OAuth 1.0a, and the WRAP proposal. It is fair to say that the very different assumptions about what are appropriate security protections between OAuth 1.0a and WRAP have created tensions within the IETG OAuth WG. While OAuth 2.0 initially reflected more of the WRAP input, lately (i.e. fall 2010) there has been a swing in group consensus that the signatures of OAuth 1.0a that were deprecated by WRAP are appropriate and desirable in some situations. Consequently, signatures are to be added back as an optional security mechanism. While many deployments of OAuth 1.0a survive, more and more OAuth 2.0 deployments are appearing – necessarily against a non-final version of the spec. For instance, Facebook, Salesforce, and Microsoft Azure ACS all use draft 10 of OAuth 2.0. OAuth provides a method for clients to access server resources on behalf of a resource owner (such as a different client or an end-user). It also provides a process for end-users to authorize third-party access to their server resources without sharing their credentials (typically, a username and password pair), using user-agent redirections. In the traditional client-server authentication model, the client requests an access restricted resource (protected resource) on the server by authenticating with the server using the resource owner's credentials. In order to provide third-party applications access to restricted resources, the resource owner shares its credentials with the third-party. This creates several problems and limitations. 1. Third-party applications are required to store the resource owner's credentials for future use, typically a password in clear-text. 2. Servers are required to support password authentication, despite the security weaknesses created by passwords. 3. Third-party applications gain overly broad access to the resource owner's protected resources, leaving resource owners without any ability to restrict duration or access to a limited subset of resources. 4. Resource owners cannot revoke access to an individual third-party without revoking access to all third-parties, and must do so by changing their password. 5. Compromise of any third-party application results in compromise of the end-user's password and all of the data protected by that password. OAuth addresses these issues by introducing an authorization layer and separating the role of the client from that of the resource owner. The protocol centers on a three-legged scenario, delegating User access to a Consumer for resources held by a Service Provider. In many cases, a two-legged scenario is needed, in which the Consumer is acting on behalf of itself, without a direct or any User involvement. OAuth was created to solve the problem of sharing two-legged credentials in three-legged situations. However, within the OAuth context, Consumers might still need to communicate with the Service Provider using requests that are Consumer-specific. Since the Consumers already established a Consumer Key and Consumer Secret, there is value in being able to use them for requests where the Consumer identity is being verified. This specification defines how 2-legged OAuth works with OAuth 1.0. But it never became an IETF RFC. With OAuth 1.0 - 2-legged OAuth includes two parties. The consumer and the service provider. Basically in this case consumer also becomes the resource owner. Consumer first needs to register a consumer_key and consumer_secret with the service provider. To access a Protected Resource, the Consumer sends an HTTP(S) request to the Service Provider's resource endpoint URI. The request MUST be signed as defined in OAuth Core 1.0 section 9 with an empty Token Secret. All the requests to the Protected Resources MUST be signed by the Consumer and verified by the Service Provider. The purpose of signing requests is to prevent unauthorized parties from using the Consumer Key when making Protected Resources requests. The signature process encodes the Consumer Secret into a verifiable value which is included with the request. OAuth does not mandate a particular signature method, as each implementation can have its own unique requirements. The protocol defines three signature methods: HMAC-SHA1, RSA-SHA1, and PLAINTEXT, but Service Providers are free to implement and document their own methods. 2-legged OAuth with OAuth 1.0 - the request to the protected resource will look like following. This blog post explains with an example, how to use 2-legged OAuth with OAuth 1.0 to secure RESTful service. Now, let's look at OAuth 2.0 - still at the stage of a draft specification. This doesn't talk about 2-legged OAuth. But - it can be implemented with different approaches suggested in OAuth 2.0. Have a look at this & this - both talk about how to implement 2-legged OAuth with OAuth 2.0 - and those discussions are from the OAuth 2.0 IETF work group. 1. resource owner : An entity capable of granting access to a protected resource (e.g. end-user). 2. resource server : The server hosting the protected resources, capable of accepting and responding to protected resource requests using access tokens. 3. client : An application making protected resource requests on behalf of the resource owner and with its authorization. 4. authorization server : The server issuing access tokens to the client after successfully authenticating the resource owner and obtaining authorization. In case of 2-legged OAuth, client becomes the resource owner. We can at very high-level break the full OAuth flow in to two parts. Let's see how the above two steps work under 2-legged OAuth. OAuth 2.0 defines a concept called - "authorization grant" - which is a credential representing the resource owner's authorization (to access its protected resources) used by the client to obtain an access token. This specification defines four grant types. "Client Credentials" is the grant type which goes closely with 2-legged OAuth. With "Client Credentials" grant type, the client can request an access token using only its client credentials (or other supported means of authentication) when the client is requesting access to the protected resources under its control. Once the client makes this request to the authorization server - it will return back an access token to access the protected resource. The access token returned back to the client could be either of type bearer of MAC. The "mac" token type defined in ietf-oauth-v2-http-mac is utilized by issuing a MAC key together with the access token which is used to sign certain components of the HTTP requests by the client when accessing the protected resource. The MAC scheme requires the establishment of a shared symmetric key between the client and the server. This is often accomplished through a manual process such as client registration. The OAuth 2.0 specification offers two methods for issuing a set of MAC credentials to the client using..
2. The HTTP "Set-Cookie" response header field via an extension attribute. When using MAC type access tokens with 2-legged OAuth - the request to the protected resource will look like following. Bearer type is defined here. It's a security token with the property that any party in possession of the token (a "bearer") can use the token in any way that any other party in possession of it can. Using a bearer token does not require a bearer to prove possession of cryptographic key material (proof-of-possession). When using Bearer type access tokens with 2-legged OAuth - the request to the protected resource will look like following. The client should request access tokens with the minimal scope and lifetime necessary. The authorization server will take the client identity into account when choosing how to honor the requested scope and lifetime, and may issue an access token with a less rights than requested. When securing APIs with OAuth - this 'scope' attribute can be bound to different APIs. So, the authorization server can decide whether to let the client access this API or not.